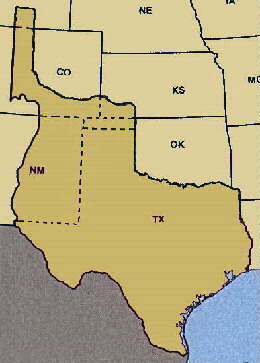 During its early years of statehood, Texas claimed territory about fifty percent larger than its present boundary, including parts of the present states of New Mexico, Oklahoma, Kansas, Colorado and Wyoming (see graphic below). Much of this land was contested by other groups, with the result that emotions on both sides of the issue reached the point of hostility by 1850. BREAKUP OF TEXAS: Of the land claimed by Texas after annexation (left), about 1/3 was ceded to the U. S. in exchange for $10 million in the Compromise of 1850. Four different plans for the breakup (right) were proposed in the boundary dispute. Thomas Benton Plan (January 16) -- would divest Texas of its northern and western territory and later split Texas into two states. John Bell Plan (February 28) -- similar to Benton's Plan, but would split Texas into three states. Henry Clay Plan, representing a committee of thirteen (April 17) -- reduced the size of Texas by about the same amount, but with no provision for further subdivision. James Pearce Plan (August 5) -- similar to Clay's Plan, but set the boundaries known today. The Pearce Plan was adopted on September 9, 1850. Although Texas lost almost one-third of its territory under this plan, the settlement also included compensation of $10,000,000, which provided much needed funding for Texas to pay its pre-statehood debts. The plan defined the familiar boundaries known by all Texans today. The resolution of this boundary dispute, along with other national legislation related to sectional and slavery issues, became known collectively as the Compromise of 1850.